If you are missing either of the above, go to the Diigo Preliminary page and complete the tasks. Find a Web page worth bookmarking. If there is an opening paragraph or sentences that capture what the page is about, highlight that text on the Web page (as in this graphic showing the iPad’s Web Highlighter). 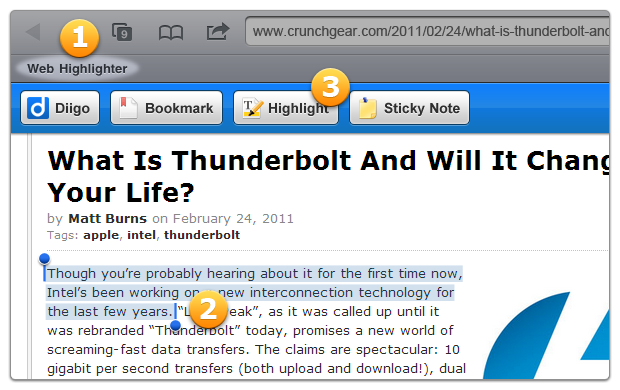 Use the toolbar, Diigolet, Web Highlighter, Chrome extension or right mouse click to open the ”Save Bookmark” window. The highlighted text is automatically copied into the description field. Complete the Task: Repeat the steps above until you have found 5 – 10 good links on the topic you’re researching. Advanced: Spread the Wealth! Share the Joy! Work Smarter and Faster! Once you complete the task, you are ready to keep using this skill to help you learn and also to go to the next Level: 2 Evaluating and Sharing.